Most Gmail users have probably never looked into the large array of settings available on the web interface, and even for those that have, the screenshot above may not look very familiar. That's because it's the kind of option people set once and never look back. The setting is referred to as your inbox type, but it's really about sorting messages with certain criteria to the top. The web interface offers five options, but the mobile app is restricted to just two: Default and Priority. In the latest update, new strings were added for the three missing options: Important, Unread, and Starred. Just like Gmail's web interface, the default will still be "Default inbox," the standard reverse chronological order we're probably all still using. I've got a feeling the implementation of the new options isn't quite ready in this version, but I wouldn't rule out the possibility Gmail could turn it on remotely. There are actually lines for both the old and new selectors, but the new set with all five options is currently disabled. 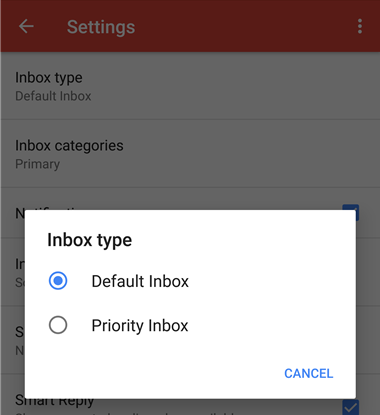 Note: inbox-type-gig is the new setting with all five options, inbox-type is the old setting with just two. As I said before, many people probably aren't even aware that the inbox sorting method can be changed, so this might be an interesting opportunity to try out one of the other options to see if they might work better for you. I'm not sure how many people actually change their sorting methods versus opening each type (i.e. Important, Starred, and Unread) from the navigation drawer, but for the true power users that have found one of these methods to be efficient, this is probably an incredibly welcome improvement.